The Apple Watch allows users to take a screen shot of what they see on the face of the device by using a similar mechanism to capture screen shots on an iPhone or iPad; you press two buttons at the same time. For the Apple Watch, the buttons to press to take a screenshot are the two side buttons, the rotating digital crown, and the power button underneath it. Just like other iOS devices, when a screenshot has taken the screen on Apple Watch will briefly flash indicating it was successful. The Apple Watch screen shot image file will appear on the iPhone within the Photos app as part of the general camera roll album. Yes, you read that right, the screenshot from the Apple Watch will save to the iPhone that the Apple Watch is synced to, it will not be saved to the Watch itself. 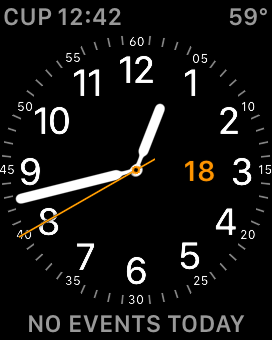 Yes, that’s the full resolution of a screenshot taken on a 38mm Apple Watch. 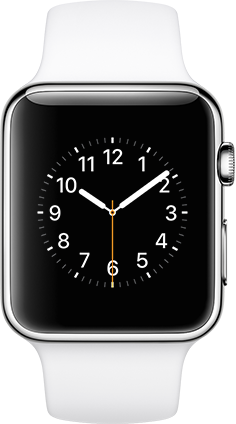 Screenshots taken on 42mm Apple Watch are slightly larger, but not by much. 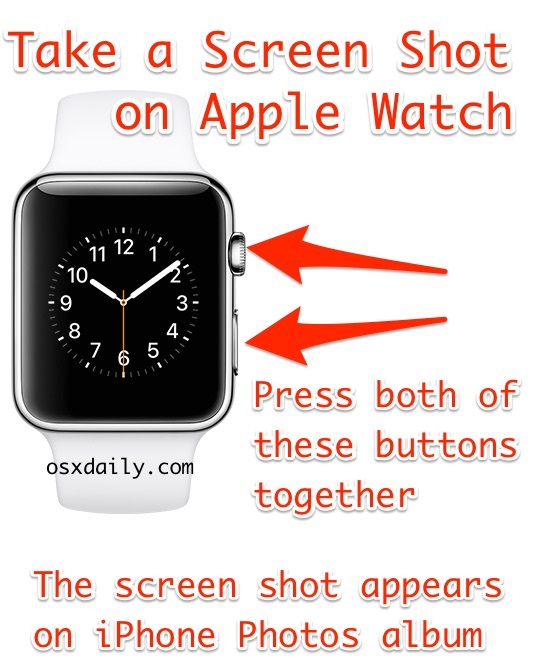 You’ll find the screenshots taken on Apple Watch are not going to appear as the highest quality thing in the world, partially because the resolution of the screen is significantly less than what is seen on retina iPhone displays, so don’t be surprised if it looks a little grainy or pixelated, and if you see it on a larger device, the screen shot will appear kind of small with a low resolution. It works!!! Thanks for sharing the tip, There is a flash and a clicking sound of the shutter. Ah how I love Apple. This watch is such a flop. What a colossal mistake Apple made with this thing. No wonder the stock is headed down the crapper. $127.88 today, 6/18/2015, hardly seems like “down the crapper” to me. Unless, of course, you don’t own any (which I do) and are just complaining about sour grapes. You have to be smarter than the watch to know what kind of functionality it can provide. Apple is 1 of the best performing stocks ytd, but again, you have to know a little about investing to know this. Go back to your Timex! Really? 2.7 million Apple Watches were sold already. AAPL stock is also hovering near all time highs. You’re a terrible scholar. Which two buttons was that again? The two buttons on the side of the watch, the rotating button is a button, it doesn’t look like a button, but it’s a button. It’s like a knob. Anyway, press that knob, and the other button on the side of the Watch. There are only two buttons on it, so press both together for a screen shot.